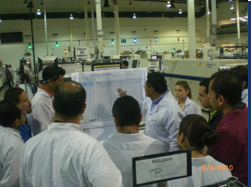 We may think, based in all the information about Lean Manufacturing, that many tools and methods are well understood, unfortunately on real live there is many misunderstanding about them, that’s why I decided to write this article, for one of the most popular and known tool, SMED. I have to clarify and specify this is one way of how to implement this tool, this not perfect obviously, but should give you an idea of how start the deployment for Setup Reduction. The absolute minimum amount of time needed to changeover from one activity to another, to minimize the amount of time the equipment remains idle, thereby responding faster to customer needs. Changeover time is the total elapsed time between the last unit of good production of the previous run, at normal line efficiency, to the first unit of good production of the succeeding run, at full line efficiency. Why do Quick Setup / Changeover? 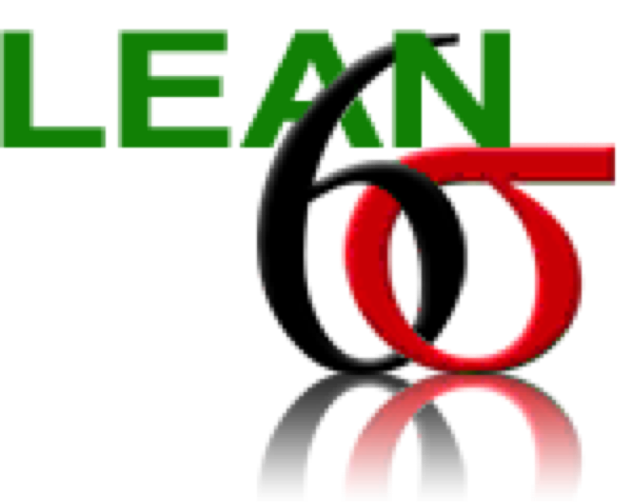 In essence organizations need to become leaner! Changing a tire in our car is a chore that will take anywhere from minutes to hours , as we see on first video. Why is it that in the car races they can change the four tires in just a few seconds as showed on second video? What is an Internal Step? An internal step is one that must be performed while the machine or operation is stopped; and therefore is a form of lost time. What is an External Step? An external step is one that can be performed while the operation is running. The primary focus of setup reduction is not on total setup time (internal + external) nor on setup labor time, but on internal time alone. 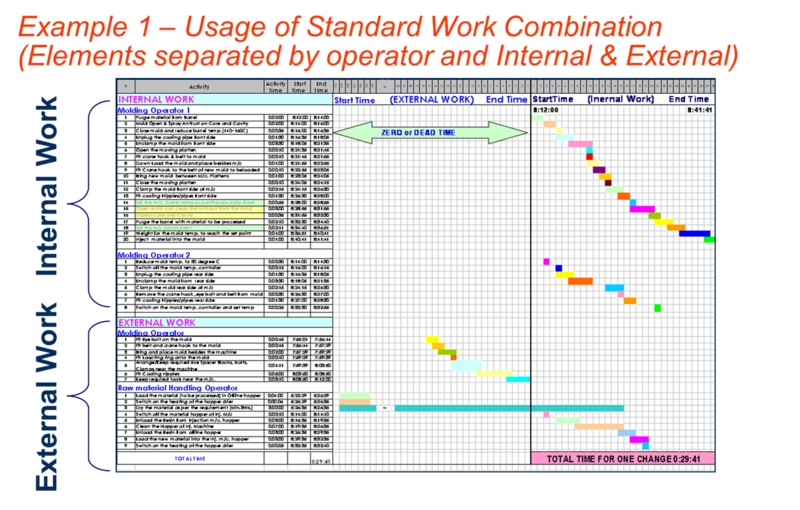 While reducing total setup time and setup labor time is desirable, it is only of secondary importance. · To reduce internal setup time. The more setup steps, decisions, adjustments, etc. that can be done on external time, the better. 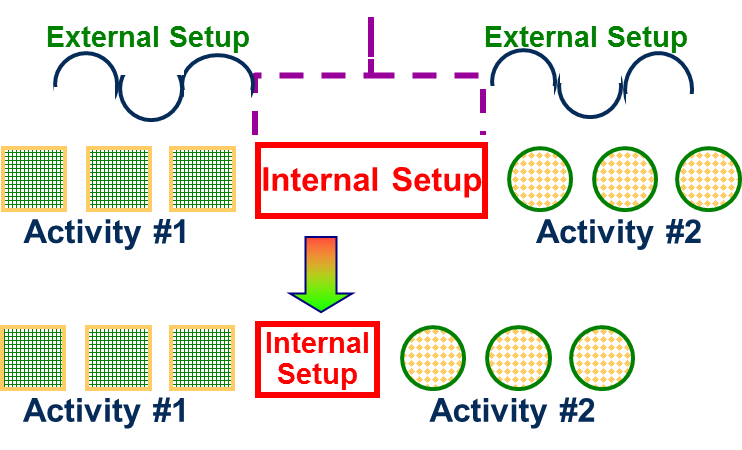 · Wherever possible, setup steps performed while the operation is stopped (internal) need to be completed while the operation is running (external). 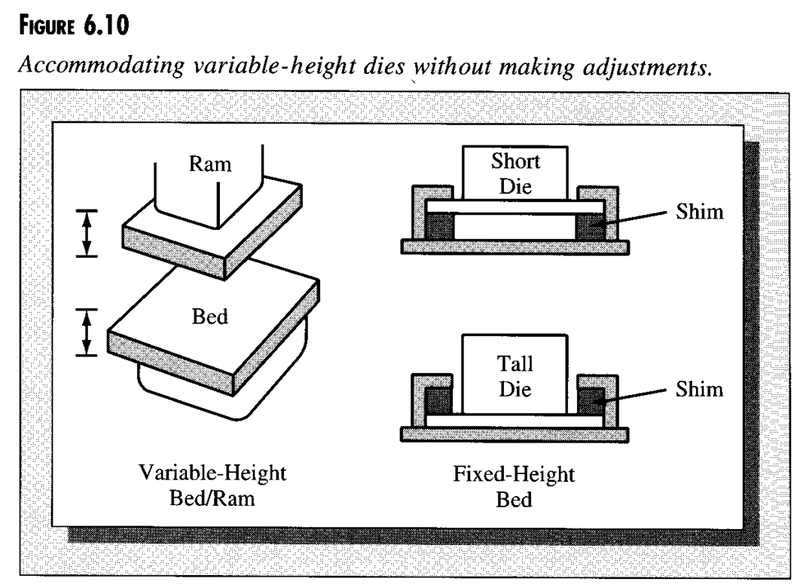 · Can adjustment blocks be used in lieu of making machine adjustments? 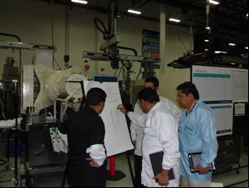 · Can dies be preheated independent of the equipment operation? 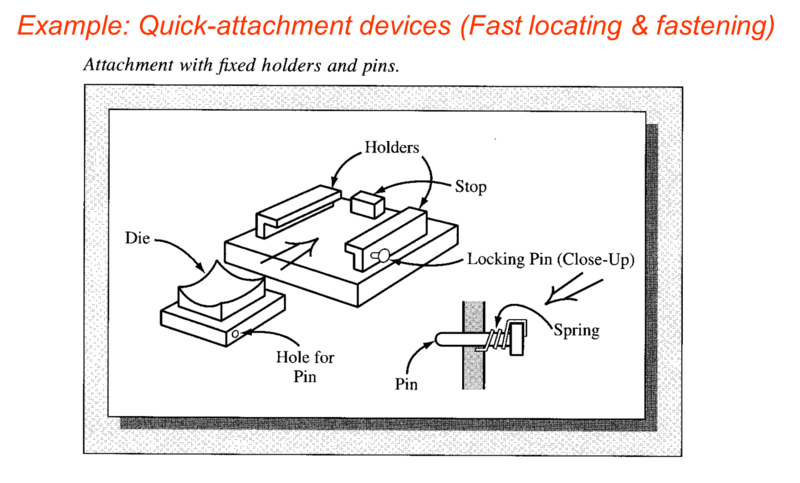 · Can procedures/techniques be developed to insure that all tools, equipment, and materials are staged in the immediate work area before the machine is idled? 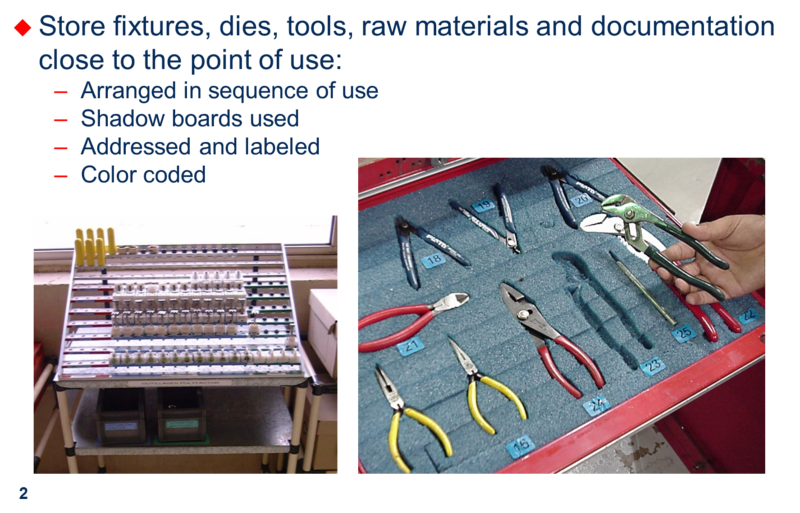 · Is all post setup work (tooling service, cleaning, data tracking, etc.) being done after the equipment resumes operation? 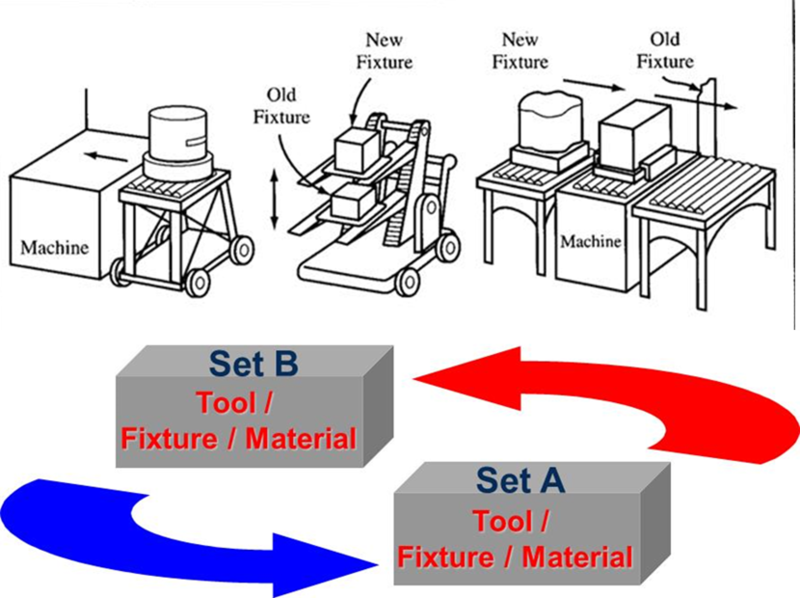 To reduce internal setup time: The internal setup steps and decisions need to be simple and precise while adjustments got to be reduced and eliminated. · Can adjustment blocks or preset gauges be used? · Can tooling presets be used? 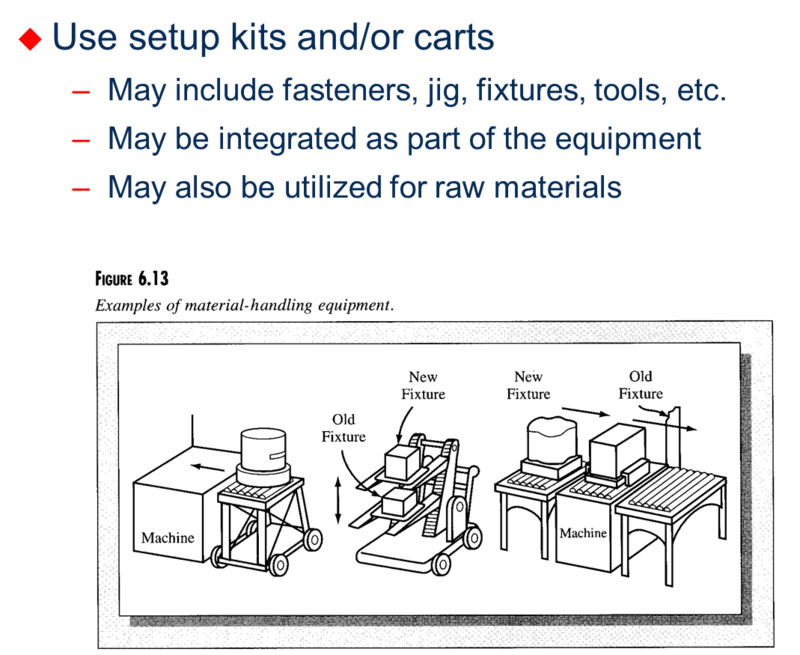 · Eliminate model specific conveyors and other material handling devices where possible. · Since the maximum external setup time must be less than the time to run a production lot, reducing external setup time typically is less critical than reducing internal setup time. · Although external setup time generally is not the constraint to the setup procedure, tools/techniques should be applied to optimize and standardize external setup time… think of resources and cost. · May include fasteners, jig, fixtures, tools, etc. 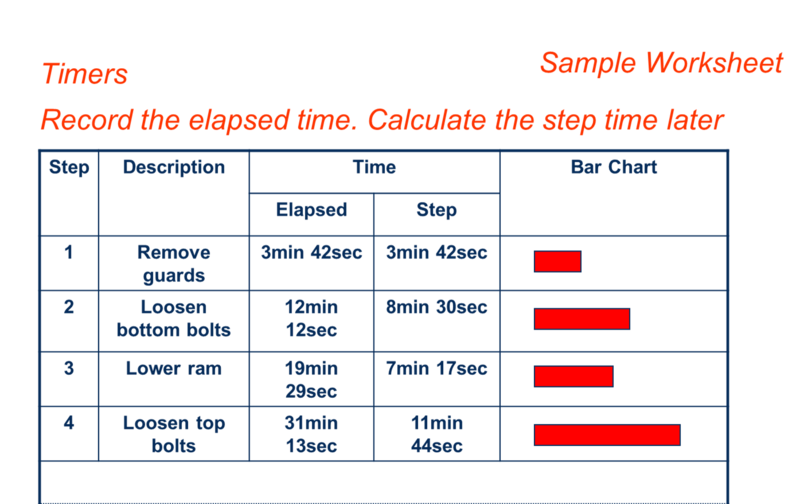 · Reduce external setup time. · Establish setup kits and carts. 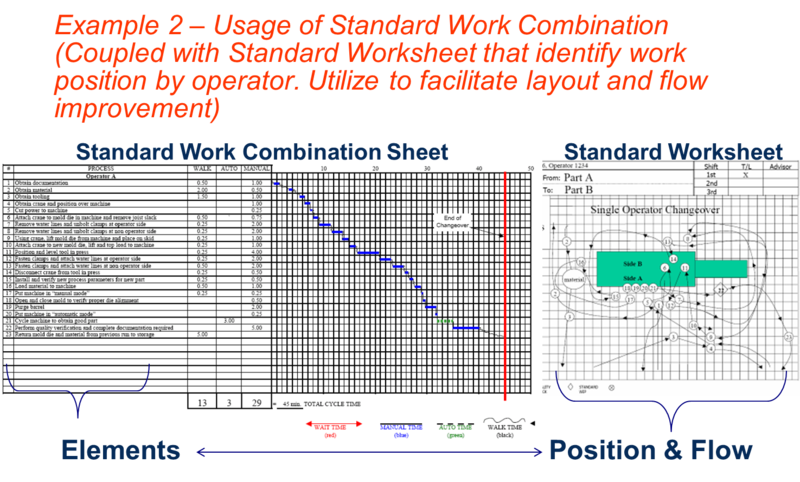 · Standardize/Document: Each step of the setup/changeover must be standardized and documented through the use of written procedures and/or checklists. This is not only necessary to sustain the improvements, but is necessary for future improvement activities. · Train: Everyone involved in the setup/changeovers must be fully trained. Often the gains made in setup/changeover improvement activities are lost the first time that personnel assignments are changed. Appropriate procedural documentation and training is the only way to insure that gains are not lost. 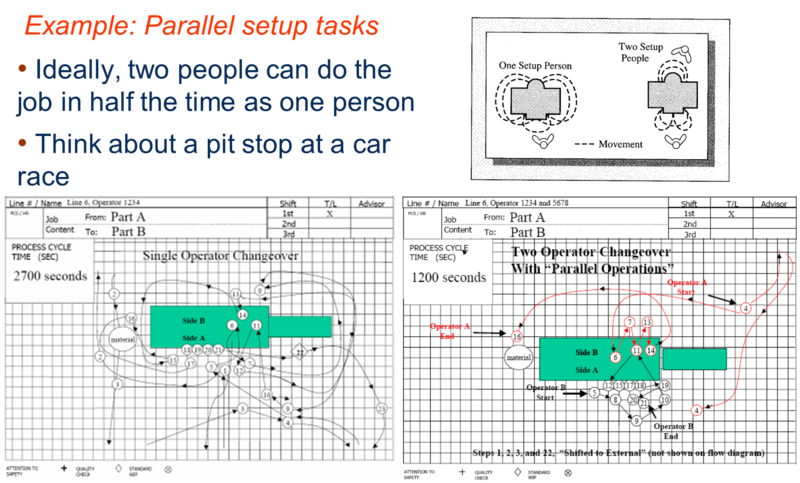 · Measure/Follow-up: Setups/changeovers must become a measured part of operations. Performance must be monitored and investigation accomplished when performance deteriorates. · Eliminate part proliferation through design. · Make multiple part numbers and / or parts in one step (i.e. : right hand and left hand). · Design tooling / process to facilitate different parts without changeover. I hope this information helps you in your next Kaizen Event. Thanks for shared great information about lean manufacturing! You have post very useful information to get healthy body. Keep posting so that we can read some interesting information on this. Six Sigma is a practice that every team has to understand and acknowledge its importance and successfully execute the six sigma tools in the projects. 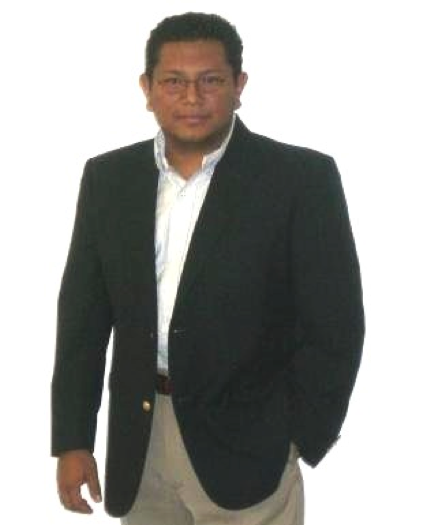 Six Sigma professional the better the revenue of the organization will increase. This is because they have the ability to streamline any sort of complex process which directly results as an asset for the organization. Thank you for sharing such an amazing and informative post. Really enjoyed reading it.